When at Vinisud back in February, the happy rumbling around town was that Cairanne had just gone from being Côtes du Rhône Villages to a full cru meaning that from 2016 onward, those studying all things wine have yet another appellation to deal with. This is most certainly not a bad thing. For those who may not know, Côtes du Rhône Villages has a lot of hidden gems in it as shown by the fact that many of the village level regions do indeed get promoted to proper crus. Even cellars who produce top-end wines in say, Châteauneuf-du-Pape produce some stellar Côtes du Rhône as well, for example La Pialade of Chateau Rayas. Cairanne has been working on attaining cru level for some time. They achieved Côtes du Rhône in 1953 and the higher-ranking Côtes du Rhône Villages in 1967. While this final “cru bump” has taken a good deal of time, it was nice to seem them finally achieve it as I’ve been aware of their wines while at the Village level for some time as they represented an excellent price/quality ratio and now we see why. 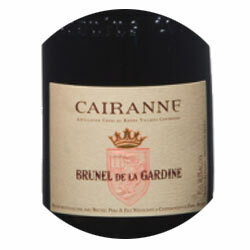 In salute of this triumph, I picked up a bottle of 2013 from Brunel de la Gardine to pay tribute to days gone by. Of course now I’m not fully sure why I did pick up the ’13 as it wasn’t the strongest of years for the region. Despite that, it showed well overall (because Grenache is awesome sauce) and I most certainly didn’t regret it. That said, I wouldn’t recommend it for purchase at this point and anyone with a bottle at home should definitely drink it in the rather immediate future. Look to the ’14s and ’15s though as there’s some fine wines there in those pre-AOC days. Purple with ruby rim. Dark fruit, prune with blue fruit as well. Baked plums, touch of chalk, stony, white pepper, minor earthiness, candied fruit. Medium plus body and medium acidity. Body continues to hold on to the dark fruits, good tannic grip, medium finish. Big reduced. Syrah component definite feels more hot weather than cold and threatens to unbind from the Grenache.